Enter our Summer contest to win a FREE RTIC cooler or 4 Atlanta Falcon Tickets! Do not let the # (hashtags) scare you, it is as easy as copying and pasting to a post. Grab a Bear of Real Estate koozie to keep those summer drinks cool. Please call us at 404-793-BEAR (2327), drop by the office, send us a message via Facebook or email us to coordinate delivery. www.facebook.com/thinkmelissa, Melissa@ThinkMelissa.com, Angie@ThinkMelissa.com, Admin@ThinkMelissa.com, or Closings@ThinkMelissa.com. Take the koozie with you to the pool, to the beach, to the lake, to the ball field or to your favorite summer hang out spot. Take a photo of your Summer koozie memory and post it to Facebook, with these hashtags: #ThinkMelissaTeam, #TheBearofRealEstate, and #BearSummerFun2018. (To make sure we see your entry, please make the post public!) Be sure to tag our team, The Bear of Real Estate – Think Melissa Team, and any of our team members too! Really want to win??? 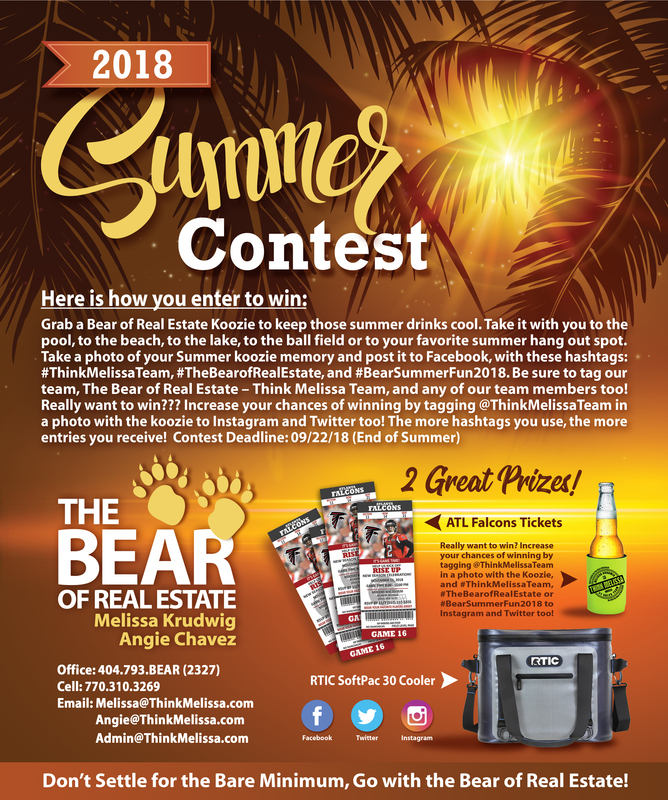 Increase your chances of winning by tagging @ThinkMelissaTeam in a photo with the koozie and use all three hashtags: #ThinkMelissaTeam, #TheBearofRealEstate or #BearSummerFun2018. Don’t forget Instagram and Twitter! The more hashtags you use, the more entries you receive!! !